Llys Cennen Solicitors (Ammanford) is authorised and regulated by the Solicitors Regulation Authority SRA No. 59301. Take the M4 motorway until you reach the roundabout at Pont Abraham. Take the third exit onto the A483. Travel along the A483 through Tycroes and Penybanc for approximately 5 miles until you reach a set of traffic lights. Carry on straight through the traffic lights until you reach Ammanford square. Turn left onto College and travel for approximately 100-150 meters and Llys Cennen is located on your left on the corner of Iscennen Road. If you wish to park in Ammanford take the last right exit before arriving at Llys Cennen onto Margaret Street then an immediate right into a large pay and display car park. On exiting the car park through the arcade take a right and Llys Cennen is located roughly 100-150 meters on your left on the corner of Iscennen Road. Take the A48 until you reach the roundabout at Pont Abraham. Take the first exit onto the A483. Travel along the A483 through Tycroes and Penybanc for approximately 5 miles until you reach a set of traffic lights. Carry on straight through the traffic lights until you reach Ammanford square. Turn left onto College and travel for approximately 100-150 meters and Llys Cennen is located on your left on the corner of Iscennen Road. Proceed along the A40 southwest for approximately 6 miles until you reach the Llangadog roundabout. Take the second exit and continue to travel along the A40 until you reach a roundabout taking the first exit onto the A483. Remain on the A483 through Llandeilo town centre until you reach the roundabout at Ffairfach. Proceed straight across the roundabout and travel for 7.5 miles passing through the village of Llandybie. 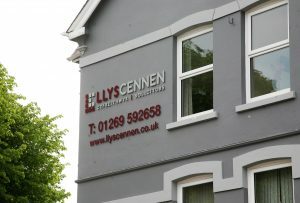 Llys Cennen is located on your right on the corner of Iscennen Road roughly 100-150 meters before Ammanford town square. If you wish to park in Ammanford take the first left exit after passing Llys Cennen onto Margaret Street then an immediate right into a large pay and display car park. On exiting the car park through the arcade take a right and Llys Cennen is located roughly 100-150 meters on your left on the corner of Iscennen Road.